The smallest Meeple. This little guy is about 3cm tall and is covered all over in the green-brown glaze, but as I mentioned above, it came out a lot more metallic on him than on the crocodile. 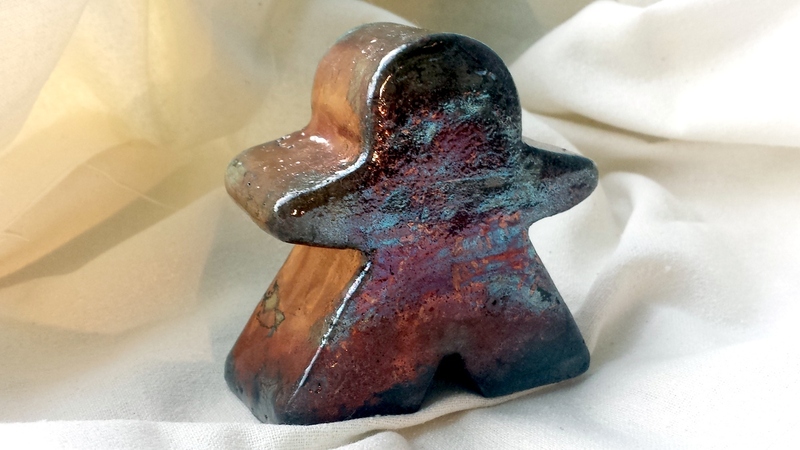 This is second to biggest Meeple in my set, about 8cm tall, and was done in “turquoise” with some black glaze around the feet and splatters of black up to about his waist (so there wasn’t a strong line where the colours changed). 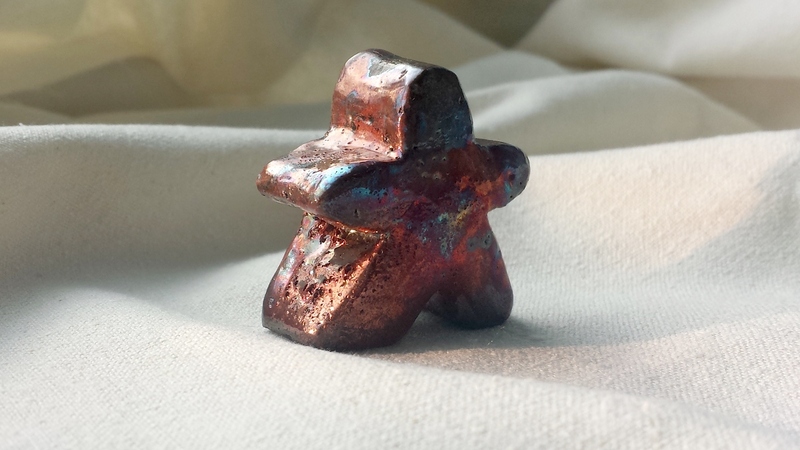 I glazed him before really knowing how the turquoise would work – I thought it would be the under-the-chin blue rather than copper, but I love the copper so much. The other side of the Meeple is smoother, almost marbleised metallic but this side is lightly textured – possibly because of how it was sat in the sawdust? 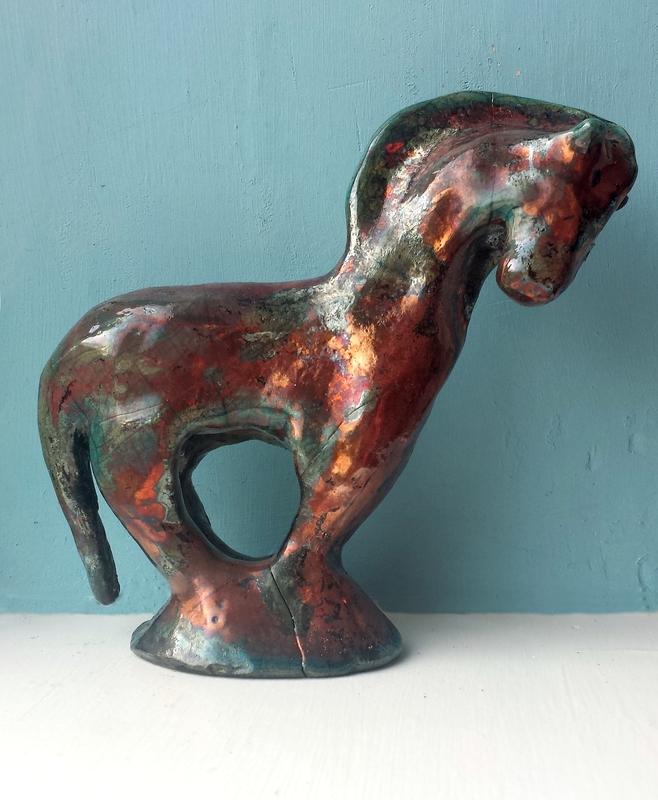 This horse, which is a bit wonky (though not as flat as he looks in the photo) but was inspired by a beautifully graceful bronze Etruscan antelope, is also in turquoise and has similar smooth/textured sides – though in this case, I prefer the smooth (which is good, because that’s the “front” and also there is a little kiln shelf or something stuck to the back of the head). I wanted it to look coppery, with the bluer bits almost appearing like verdigris. There are some cracks in the base and appear to be more elsewhere, so I didn’t want to scrub at the residue black staining too much – it also might crack at a later date, but I’ll enjoy it while it’s whole! 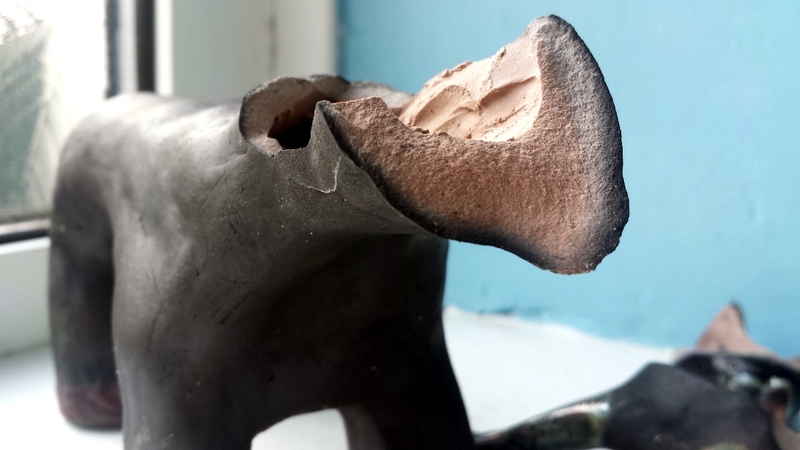 And speaking of breakages, this is the minoan bull that broke – it seemed to survive the Raku process and the journey home but broke when I was cleaning up the horns. 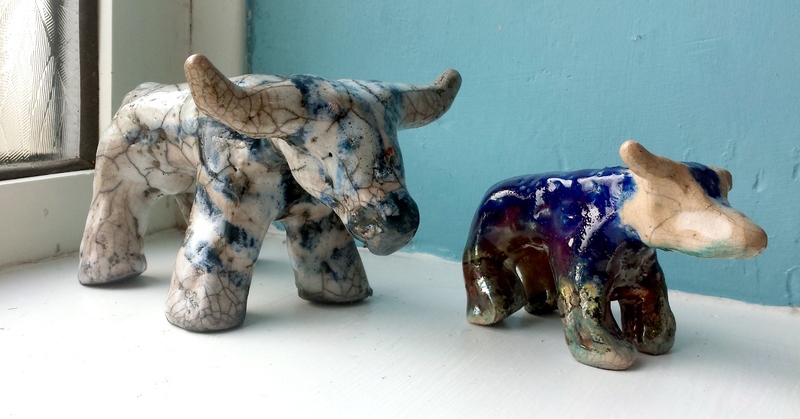 It’s a shame because I loved this guy – he was the last bull I made so the best/most refined, and I like the contrast between his black body and his shiny horns, nose and a sun-spot on his head (those they all came out on the turquoise side of the glaze, rather than coppery). 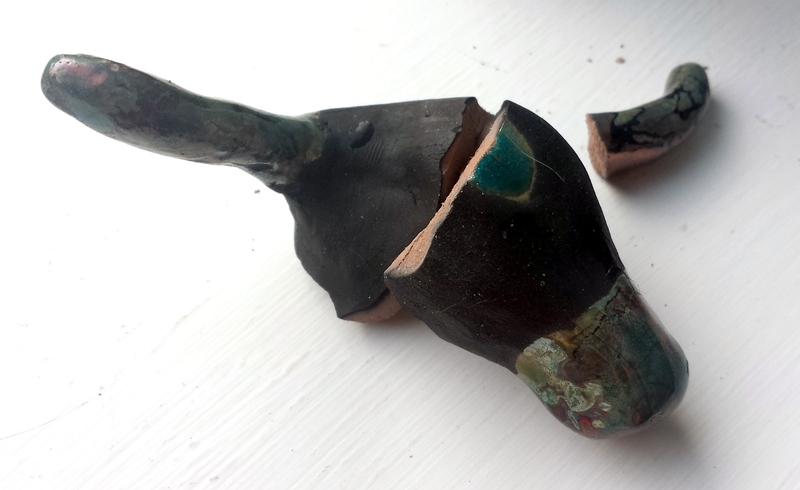 Still, his breaking allowed to me to “ooooh!” at how far the carbon coloured the clay. 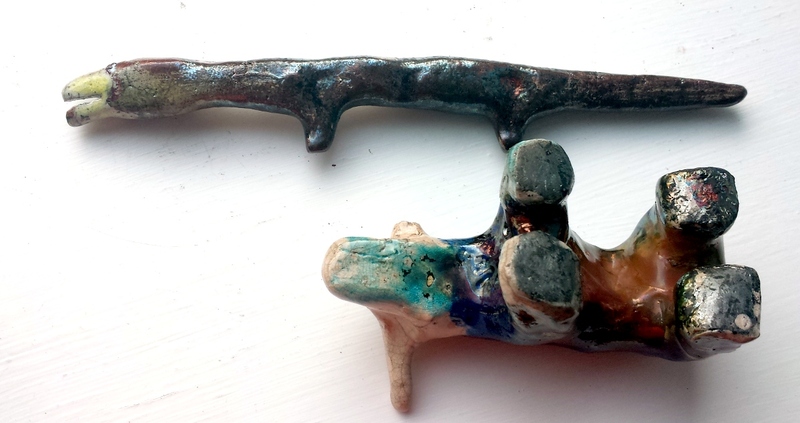 Cracks are, of course, undesirable but as I said, crackles are a key feature of a lot of Raku work. 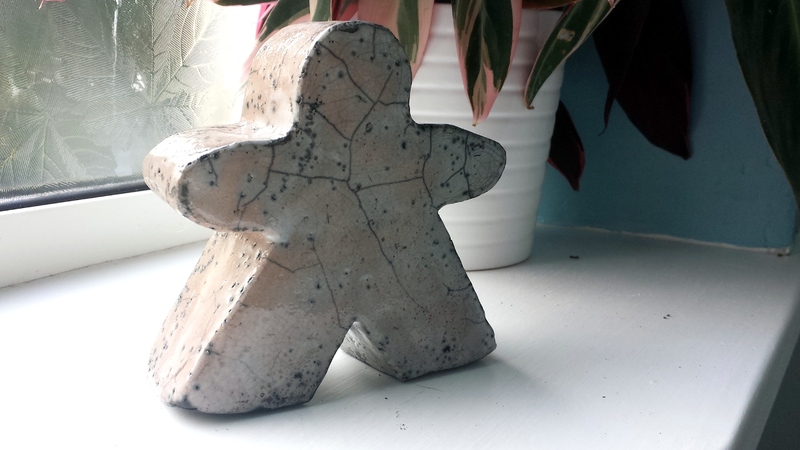 I also wanted a crackly Meeple, and running out of time, I decided to do an all over white large-crackle glaze on the largest one – I was really running out of time and I got my buddy Amanda to apply the gloop. She had other – better – ideas but I couldn’t picture them in the moment so we went for the all over option instead. I wish I’d thought about it a bit more carefully – I think crackle white on the front/back and black sides (or vice versa) would have been a lot nicer. Nevermind though, it’s a good example for me of large crackling (and, I think, of sugar thrown into the kiln to get the spotting?). I smoke-fired a terracotta pot I made at the start of the year, a strange bust thing I made last autumn (which is, possibly, the thing that put me off sculpture – I would have recycled it before bisque but I thought it would be useful for glaze testing or similar — which is how I’ve used it here), a black slip-coated terracotta pot that has already been fired to earthenware (with a yellow-ish glaze inside) and two little pendant type things. 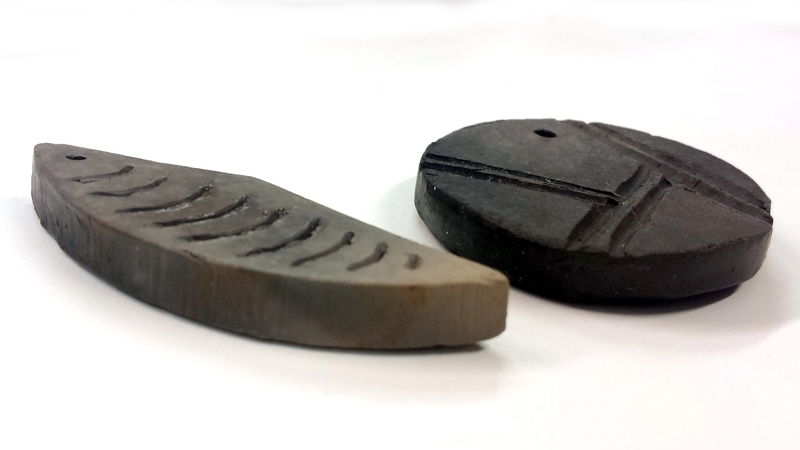 The pendants are probably my favourite pieces from the smoke-firing (even if I did forget about them on the day and had to go hunting for them in the dowsed sawdust remains yesterday afternoon) – the round one is a relatively uniform soft black and the other one looks like it’s been dip-dyed in smoke (for want of a better description). Other people like the contrast between the black and the raw clay of the bust (I do too, but find it more intriguing than anything – what stopped that side getting smokey at all?) and the varied smokiness of the terracotta pot – it’s only like that on one side though, the other (& inside) is just a bit patchy, as is the whole of the black slipped pot. I might try smoke firing them again when I have enough items to warrant doing a load at home. It would be possible to do a Raku firing at home too – the little gas kilns are not quite as expensive than electric ones (they can be made relatively easily too) – and I am tempted. I’m not a sculpture/figure maker but I very much like the bowls I made & Raku fired. (I’ve not been able to photograph decently yet but they’re glazed with my favourite turquoise on the inside – which has gone copper in one, and a greeny in the other – and are burnished & a beautiful rich black on the outside, with some coppery glaze spatters for interest – you can see them in the very small picture at the top.) The process is terrifying but results in such interesting pieces that I might be able to get over the fear! 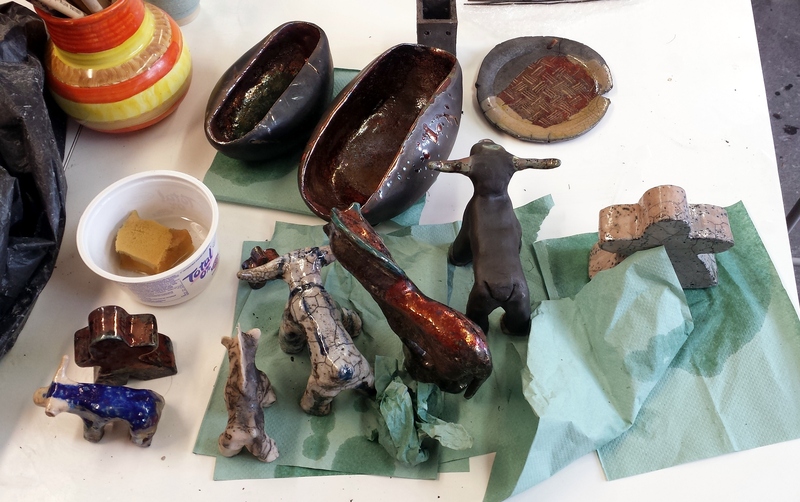 I would highly recommend Raku firing (and indeed, the Hive courses) to anyone with any pottery/ceramics experience – I’m not sure I could cope with the unpredictability or the excitement if it was my very first ceramics adventure! 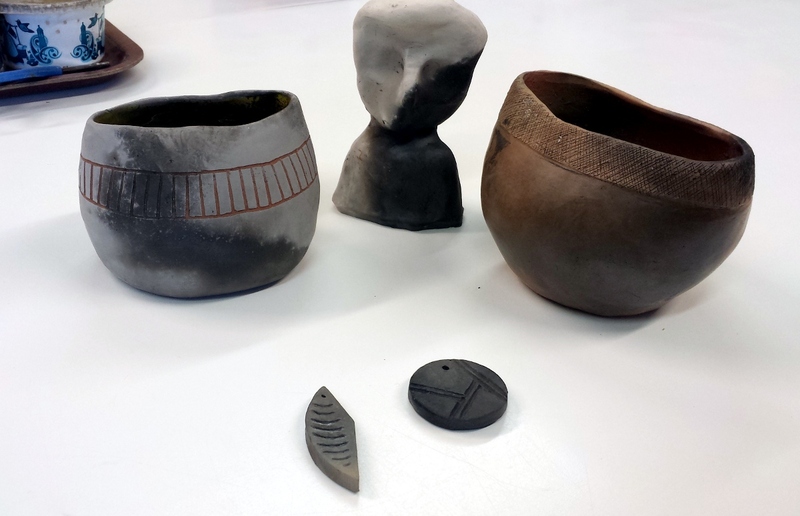 Many thanks to Rachel & Jane H at Hive for fabulous teaching, and for Gill for running a second kiln on our second day – we were incredibly lucky to have access to such a fantastic range of knowledge and skills.